Here's a map of Ormskirk, Lancashire, the little town of which we hope, by the end of this week, to be part-time residents. We are going there to complete the very long process of purchasing a flat. You can enlarge the map enough to see individual cars and even people. Or if you have greater interest, click on the link below to see a larger map, then a tab appears at the top of the larger map, called "More." Clicking that allows you to display a few photos of the place. (Some of them appear as very tiny squres. Mouse over them until you get the pointing forefinger icon, then click.) Or if you choose to view it in Google Earth, you can see all sorts of other stuff, such as where restaurants, pubs, and certain stores are. I've been studying the map to try to get my bearings a little before we arrive there tomorrow morning. Fun! Oh, yes - the marker in Southport shows where our hotel is (because that is where our solicitors are); the others in surrounding areas outside of Ormskirk are Orthodox churches. Today is the Jewish High Holy Day of Atonement. It begins at sunset. They have a well-loved hymn sung on this day, the Kol Nidre, which means "All Vows." It's a prayer for release from any vows made to God and left unfulfilled. Sometimes, especially since World War II, it has come to refer especially to baptismal vows made under duress. I think the hymn is quite beautiful, and except for a certain plaintive quality some say is characteristic of Jewish music, it reminds me some of Russian Orthodox chant. Go here to hear a very good recording of it. ...what ought to be done with an old Bible? It's falling apart and I can't even find all the pages. It's the NIV, for which I never had any use anyway. It's not quite an antique, but getting there, and looking it. It has no sentimental value, didn't belong to, say, any grandparent. What's a reverent way to dispose of an old, unwanted Bible? Root Canal. For anyone who has never had a root canal, and/or, like me, never knew what one was, I can report that it is a very deep filling, and that, provided you have a good endodontist, you won't feel a thing. In fact, the procedure was so long, and the doctor and his assistant so full of pleasant chatter in which I couldn't participate, that I soon became bored and nearly fell asleep while they were working on me! It never did hurt afterward, either, although the doctor predicted it would. I never had to take so much as an aspirin. Hint: whenever a dentist numbs your mouth, ask for the version of the drug that does not contain epinephrin ("eh-peh-NEH-frin") Epinephrin is another name for adrenalin. Adrenalin, as you know, is what your body pumps out when you're scared. It gives you that churning stomach feeling, and gives me the jitters. You'll be a lot more relaxed, a lot calmer, without it. Only thing is, the numbing lasts a somewhat shorter time without epinephrin. This was no problem for me; it lasted until well after the very long procedure was finished. I've had it done twice before, too, with no problem. Purchase of flat in England. Things have changed a lot in the 30 years since Demetrios opened his bank account in the UK. Today, we are living in the age of counter-terrorism. Therefore, when you transfer large amounts of money (as in, enough to buy that flat) from your US bank to a UK bank and then want to transfer it again, as for for example to the sellers of the property, the first thing bankers today think of is - money laundering! We have literally spent since the 9th of July trying to arrange these transfers, and have not succeeded. The funds are in the UK bank, but they aren't going to release them to our solicitors until we get there in person. This may delay the completion of the deal for a day or two. Big-time frustration, and we can't even take it out by changing banks. Our solicitors strongly caution us against doing that, as it may be difficult to find another bank that would even accept us, as foreigners. At least Barclay's knows us. Knows us very, very well. Travel Plans. Leaving Monday afternoon, arriving at Barclay's Bank Tuesday by around noon, appointment with solicitors at 1 p.m. I bought a few autumn clothes yesterday, none of them black. I'm having fun packing and planning. You move into a furnished place and you think it's ready to live in, but not so. Amazing how many things you still need, from toilet paper to wastebaskets to clocks, broom, cleaning rags, clothes hangers... the list goes on and I'm enjoying compiling it. Communications. I will take our laptop, but it won't fit the electrical outlets and I don't know whether we'll manage, this trip, both to get an adaptor and figure out how to get Internet connection. So I'm not sure whether I'll be posting anything, or e-mailing anything. And we're still not sure how we want to handle the telephone issue, either. If Only We Could Have Been There! This concert review was written by Kenneth Langbell and first appeared in the English-language version of the Bangkok Post under the title "Wild Night at the Erawan" on 27 May 1967. But such things do happen, and the person who began to laugh deserves to be severely reprimanded for this undignified behavior. Unfortunately, laughter is contagious, and by the time it had subsided and the audience had regained its composure Mr. Kropp appeared somewhat shaken. Nevertheless, he swiveled himself back into position facing the piano and, leaving the D Major Fugue unfinished, commenced on the Fantasia and Fugue in G Minor. Why the concert grand piano's G key in the third octave chose that particular time to begin sticking I hesitate to guess. However, it is certainly safe to say that Mr. Kropp himself did nothing to help matters when he began using his feet to kick the lower portion of the piano instead of operating the pedals as is generally done. My first reaction at seeing Mr. Kropp begin to chop at the left leg of the grand piano was that he was attempting to make it tilt at the same angle as the right leg and thereby correct the list. However, when the weakened legs finally collapsed altogether with a great crash and Mr. Kropp continued to chop, it became obvious to all that he had no intention of going on with the concert. The ushers, who had heard the snapping of piano wires and splintering of sounding board from the dining room, came rushing in and, with the help of the hotel manager, two Indian watchmen and a passing police corporal, finally succeeded in disarming Mr. Kropp and dragging him off the stage. I have laughed over this piece for many years and am disappointed to learn it's tongue-in-cheek. According to snopes, this story never happened. Should've known that as soon as I read that Myron Kropp was "the man who has repopularized Johann Sebastian Bach." ! Richmond really is a small town. Really. So last Friday I go to the dentist (a Greek lady) for the regular 6-month checkup/cleaning, and the hygienist asks if everything is alright and I say, "Yes, fine. Well, there is a small cyst or something on my lower right gum, but it's not as big as it was..."
So she calls in the doctor and it's an abscess. So we take an x-ray. It shows some bone loss right there. The dentist refers me to an endodontist (another Greek) for a root canal. Here's his phone number, call him. Oh, and take these pills meanwhile. First thing Monday morning, Dr. So-and-so's receptionist calls to make the appointment. "Have you been here before?" she asks. "Because your name is familiar." "Well, but it's your first name that's familiar..." says the receptionist. "I know," says she. "You're getting ready to go to England." !?!?!? I've never even heard of this person, and she knows all about me, even which insurance I have. "So can it wait until I get back?" I ask. I can hear the doctor in the background saying, "Nooooo. She needs treatment now." He has already had a look at my x-ray. Okay. So I'm going in tomorrow for a root canal. What's that? Why do I need it? Don't know. Will find out. But it's kinda nice to see this whole network of folks looking out for you. And it's that way with some doctors, too. Once I overheard the gynecologist and his new nurse talking in the hallway outside the treatment room where I was waiting. The nurse said, "Apparently this patient has been coming here for a while now..."
"Oh, yes, I've been seeing her FOREVER." I couldn't resist; I called out, "I'm not THAT OLD!" and in he came with a smile. The hostesses at several restaurants also know us by name and will say things like, "We've missed you lately. Have you been in Greece?" There's something very sweet about not being just an anonymous customer. That's typical in Greece, but not so much in lots of other places. I like it. A lot. I didn't write the first paragraph. It was provided and the challenge was to construct a short story using it as the opening. It arrived in the morning mail - a small, unimpressive-looking package wrapped in brown paper and tied with a double strand of twine. There was nothing to distinguish it from thousands of packages passing through postmen's hands. But it was different - very different. This tiny parcel was special because it was the only one Corporal Jeffrey Morgan had received in all his ten long months in Germany. And it was doubly special because it was from Margaret. Margaret was one of his Sunday School pupils, one of the ones who made the ninth-grade class interesting. She was pretty and innocent and a stubborn adherent of the old-time religion. Naïve, yes, very. But she was a challenge to him, as he hoped he was to her; he was laboring to introduce her, gradually, to more enlightened thought. She, meanwhile, was trying to convert him. Some Sundays, she even met him after church to carry on their debate. He would take her to lunch - it felt good to take out an American girl, even if she was only a ninth-grader - and they'd talk. "I used to believe in God," Jeff had admitted when they had last met. "Then I became an atheist. And now I am firmly persuaded the most intelligent position is agnosticism." After she had wondered aloud why an agnostic would want to be a Sunday School teacher, she had brightened. "It's no wonder you don't believe," she said. "You've never experienced God. What you need is to experience Him firsthand." At that point the argument had bogged down - how did one convince her that whatever she thought she had experienced was not God? - and the conversation had drifted to other things. Like his court-martial the next week. He told her he had mislaid a rifle. That wasn't the real reason for the court-martial, of course; that was a fib. He didn't even know why he had mentioned it to her at all. Perhaps he had needed someone to tell it to. At any rate, she had listened sympathetically. Please bring this package with you to evening service the Sunday after the court-marital. (You promised.) Do NOT open until then! He frowned, puzzled. Yes, he had promised to come to church this Sunday night... He shrugged, sat up, and laid the parcel in his footlocker until then. On Sunday night, he slipped into the back pew of the Army chapel just in time for the first hymn and looked around for Margaret. She wasn't hard to spot; a hanging lamp, shining directly down upon her smooth, blonde hair, made her seem the brightest object in the room. She was with her girlfriends, Cassie and Heather, and Heather's parents, Colonel and Mrs. Evanshrope. Colonel Evanshrope was Jeffrey's commanding officer and his wife was the Sunday School Superintendent. Nervously, Jeff patted the little package in his jacket pocket and sat down to endure the service and wait for Margaret. As soon as it was over, she came hurrying down the aisle to meet him. She was flushed and smiling and visibly trembling. "Hello, Mr. Morgan." "Hi, Margaret." He reached for his jacket poicket. "I - uh - seem to have received a present from you. Am I allowed to open it now?" She nodded. "In the chaplain's office. He won't be there, so he said we could use it." "Okay," he said. He followed her into the green-carpeted, book-lined office and seated himself in a red overstuffed chair opposite the one she took. "Now?" November 3. This is to certify that as of this date, Margaret Barnett and Cassie Donovan have begun daily prayer for Cpl. Jeffrey Morgan for the whole 10 days before his court-martial. Since we haven't been able to prove to Mr. Morgan that God exists and loves him, we are asking God Himself to prove it, by giving him a break at his court-martial. What kind of a break we don't know. We are praying the jury will suspend his sentence or find him not guilty or something. So that Mr. Morgan will know we really did pray for him before the court-martial, and did not just say so afterwards, we are putting this note in the mail today, for him to see, whether anything happens or not. It was signed by both girls and "witnessed" by two other girls from the Sunday School class, including Heather Evanshrope. He could feel his eyes filling up as he lowered the document and gazed over at Margaret with a dumb smile. Finally, he whispered, "It was called off. Canceled." "I know. One of your buddies told me at prayer meeting." She was radiant. "But nobody seems to know why." "No reason was given. Just suddenly at the last minute, the charge was dropped." "Then it's even better than we had hoped! Now, Jeff, now! Now God has proved His love for you." In her mind, there could be no doubt this is what had happened. "Now you can believe and be saved!" He shook his head, slowly, to prevent a tear from flying off. "You did this for me, and - Margaret, I'm not worth it. I've done so many wretched things in my life..."
"That's why you need Jesus. He has made it possible for you to receive forgiveness. If only you let it be. Give Him your life, Jeff. He will heal it. He will give you peace. He will give you joy." "And you did all this - this praying, so I could be the recipient of such joy and peace?" He was still shaking his head. She nodded. "I want that more than anything. So does Jesus. He's standing outside the door of your heart right now, Jeff. Waiting for you to let Him come in and take charge." "Margaret," he sighed, "I won't argue with you tonight. What you have is beautiful, and I wouldn't for all the world try to destroy it. But I feel I just cannot accept it, either, without prostituting my intellect." She looked puzzled and hurt. "Not even now that you've experienced God's love firsthand?" "What overwhelms me, Margaret, is not God's love..."
That remark, he saw, was lost on her. If it were not God's love, then she had failed to bestow upon him what she considered her most precious gift. That was all she perceived, and sorrow, genuine sorrow, was moving over her face. Oh, God, oh, God, he thought - it was an epithet, not an invocation - and he buried his face in his hands. He heard Margaret slide off her chair and kneel on the green carpet before him. Her purse clicked open, and he felt her lay a tissue on his knee. He picked it up. She was crying, too, quietly. Oh God, he thought again. The absurdists, the dadaists, the nihilists, they were all wrong. Life did have meaning. Yes, it might all end in the grave and have been for nothing - he was beginning to doubt that too - but meanwhile, for right now, life meant something. It meant Margaret loved him. And for right now, that was enough. This afternoon, as I sat in the cardiologists' waiting room, awaiting my 6-months check-up, I picked up a local magazine. I suppose it must have been a complimentary copy, because when I had flipped three pages, I saw this ad, featuring guess who? Our cardiologist. So I scanned it for you. 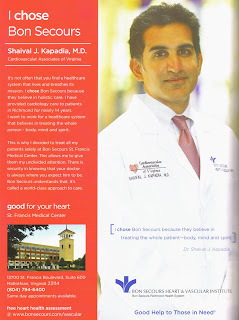 Dr. Kapadia (born here but his family is from India) is a hero to us. He saved Demetrios' life the time Demetrios had what I still call his "heart attack." A heart attack, by definition, causes damage to the heart, and Dr. Kapadia caught this one before that happened, so technically it's not a heart attack my husband had; it's a prevented one. I went into the emergency room the same day with severe chest pains. There was nothing wrong with me at the time; it was just sympathy pains, psychological. The atrial fibrillation wasn't discovered until some time afterwards, but anyway, that's how Dr. Kapadia became my cardiologist as well. And I passed the six-month check-up with high marks, thank you very much. There have been no "episodes" since Dr. Kapadia did the cardioversion. From My Attic: A Long "Short Story"
It was a beautiful Saturday afternoon, bearing no hint of trouble, when Natalia stepped inside the tiny church, dragging her vacuum cleaner behind her. She stood in the rear, blinking while her eyes adjusted to the dim interior, lit only by the late sunshine filtering through very small windows. She was a short, rather stocky woman in her mid-forties, with light brown-and-gray hair and a square jaw. Her mild blue eyes were set in a broad, kind face. The face bespoke hardship in her life, but it also showed laughter lines. For Natalia had known plenty of trouble – she had survived labor camps in Siberia and Germany – but that was long ago, and none of it had obliterated her optimistic spirit. And she had known love. While her marriage had not been all she had hoped, yet it had not been unbearable, either, as so many were. She had taken comfort in her two grown children – and in Father Gabriel. As President of the women’s sisterhood, she had become Father’s close collaborator. He consulted her often; sometimes when he telephoned, they talked for as long as an hour. Of course, he called everybody in the Sisterhood and always said many flattering things. But she knew she was the main one. Yes, it was she who looked after him, she in whom he confided, she who took him a supper now and then, or some of her fancy baked goods. She kept him carefully informed of everything pertaining to each of the parishioners. She filled many of the functions of a Matushka, for although Father had served St. Vladimir’s for over a year now, his wife had not yet joined him. Natalia revered Father; she was his eyes and ears and chief advocate, and she felt greatly honored thus to serve him. She dreaded his upcoming transfer to a parish out of state. It was strange, she thought, when her eyes had adjusted, how different the church seemed Saturdays compared to Sundays. Instead of dozens of lit tapers, only burned-down stubs stood in the sand trays before the icons. No burning incense wafted its clouds through the room, although everything was steeped in its odor: the Victorian sofa and chairs on the left side, the velvet tablecloth embroidered with the Russian cross on the right, the heavy hangings, the oriental rug. Most of all, there were none of the parishioners, none of the twenty or so people who stood and prayed here all morning on Sundays. Natalia nodded, not at all sure she understood such a sentiment. But then she never had quite understood Abigail. “The American lady,” as she was called – somewhat incongruously, for they were all Americans now – had simply appeared in church one Sunday last Spring, and had come nearly every Sunday since. That had silenced the tongues, and St. Vladimir’s, with characteristic warm-heartedness and simplicity, had taken Abigail to its bosom. She obviously knew something about holy Orthodoxy, for she knew what to do during the Divine Liturgy. She appeared devout and had even learned quite a bit of Church Slavonic. Yet she had never spoken of converting. How was one to explain a person like that? What did an American want with a Russian church anyway? Yet no more questions had been asked – until the day two months ago when she had gone away as suddenly and mysteriously as she had appeared. Aloud, Natalia said, “Nobody knows why you left us. Not even Father Gabriel can explain it.” She watched Abigail closely. Natalia knew Father Gabriel could be brusque, but she couldn’t imagine him offending anybody that much, least of all the American. The other parishioners had questioned Mr. Belov, demanding to know what he meant, but he only made the Sign of the Cross and would say nothing more. She stared at Abigail a moment and said, “So it was whispered. But then Mr. Belov, he said no, that was not the reason, that it was something more.” She scrutinized Abigail’s face for some telltale sign. “It was a very difficult decision for me, Natalia.” Abigail’s great brown eyes grew misty. Abigail moved toward the closet in the rear corner of the church and took out an apron, which she tied about her slender waist to protect her dress. Natalia wondered if the American lady never wore slacks? Then from her purse she drew a kerchief and tied it, Russian style, over her thick, dark hair. Natalia wondered how long those tresses were, when unpinned from the nape of Abigail’s neck. “Where shall I begin?” Abigail asked. Natalia and Abigail worked together in silence for a few minutes, polishing icons on opposite sides of the room. “How is everybody at St. Vladimir’s?” Abigail inquired, returning an icon from the side table to the wall and taking down another. A memory sprang to Natalia’s mind of his hospital stay, for both she and Abigail had nursed him through it. He had been just coming out of the anesthesia and was still groggy when he had looked up, caught sight of Abigail, and said, “Ah, there she is! Angel! The apple of my eye.” And he had promptly fallen asleep again. Natalia had been surprised at her jealousy when Father had said that, even though she knew such jealousy was foolish; it had only been the medicine talking. Abigail had laid down her paper towels. A wave of guilt rippled through Natalia. Abigail had emphasized that nobody should be told of her visit. Natalia had respected that wish (until yesterday, at least), although she could see no point in it. Why make such a secret of something as ordinary as dusting and sweeping? In any case, Natalia had not been minded to miss a chance of Father Gabriel’s company. Therefore, when he had proposed coming to repair the window today, she had said nothing to dissuade him. She watched Abigail apprehensively, and was much relieved when the American lady turned to her, smiling, and said, “Oh, well, since it is only Batushka, as you say…” and began rubbing the icon again. Natalia sighed and unfolded a newly-laundered length of lace-edged, white linen and draped it carefully around the icon of St. Nicolai. The door opened, the bright sunlight stabbing the sanctuary, and Father Gabriel stepped in, carrying his tool kit. He was an imposing figure, tall and robust. (Actually, Natalia thought he could probably afford to lose ten pounds or so.) His hair and beard were very black, unusually black for a man his age, only very slightly laced with silver. His eyebrows were bushy, and looking into the eyes beneath them, Natalia saw the now familiar black thunderclouds. It pained her; she had been accustomed to those eyes exuding tenderness. He was dressed in a clerical shirt with a silver pectoral cross, and wore shabby pants and even shabbier shoes. “Likewise,” said the American lady, smiling. She held out her crossed hands for the blessing, which he gave. “Yes, yes. I see… Well, better get to work. We want to be finished with everything before Vespers at four o’clock.” He walked to the front window, put down his tool chest, got a stepping stool from the closet, and set to work. Natalia kept up a gay chatter as they worked. Not that she felt gay at all, for Batushka looked very ill. It was not the walking death look she had described to Abigail, thanks be to God; it was more like a volcano about to erupt. No, she did not feel at ease. But she kept talking. For neither of her companions seemed much inclined to speak, and she was not one who could tolerate awkward silences. “Back to our hometown,” was her quiet reply. There was another long silence while Natalia searched for something with which to fill it. “The words of kindness, Natalia.” He fell silent again, and Natalia, for once, could think of nothing to say, for sheer joy. “Matushka?” Her voice was barely above a whisper. That wasn’t why Matushka was not coming, Natalia knew. Hadn’t she, Natalia, made a special point of having Father and his wife for dinner when Matushka had come for Christmas? Hadn’t she observed that there was no love between them? The Christmas visit had clearly been a disaster. With his back to Abigail, Batushka could not see the pain Natalia saw sweep over Abigail’s face before she answered, slowly: “What can I say? God has been good to me.” Yet another non-answer. Abigail had finished her icons, and was removing the candle stubs from the sand trays. “Do we have anything to scrape off wax with?” she asked. Wordlessly, Father Gabriel stepped down from his stool and withdrew a pocketknife from his hip pocket. She held out her hand. Batushka laid the unopened knife in it and closed her fingers around it, his black eyes boring into hers. Natalia was alarmed at his unsteady gait as he returned to his window. Abigail opened the knife and began scraping the wax from the big copper candle plate. It took her only a few minutes. She closed the knife and took it up to Father Gabriel. “Your pocketknife, sir. I thank you most kindly.” Her voice was teasing and cheerful, as though she had not even noticed the terrible something in his eyes and face, but she had, Natalia knew, because there were tears in Abigail's eyes as she turned away. Natalie watched her take a dollar from her pocket and put it in the offering box and light a candle. She went to the rear of the church and knelt before the icon of the Resurrection. It was nearly four o’clock, time for Vespers. Batushka put away his stepping stool and went behind the iconostas to vest. Natalia got out the broom and dustpan and swept up the paint chips he had left behind. Abigail arose, leaving her candle before the icon. She disappeared out the side door for a moment, into Father’s office, and returned, prayer book in hand. She took off her kerchief and hung her apron in the closet. “I must go” she said to Natalia. “Time to cook supper for a hungry family.” She smiled, but wanly. “Our people,” she replied, through tears. She turned to go. Father went back behind the iconostas and Natalia walked with Abigail to the door. They hugged and kissed each other; then Abigail opened the door and was gone. Natalia hesitated; women were not allowed behind the iconostas. Then fear overcame reverence, and she stepped into the forbidden space. Father Gabriel was lying on the floor behind the altar. “Father! Have you tripped?” She already knew he had not. She rushed to the back of the church where she had laid her purse, fumbled in it for her cell phone and fairly screamed at the 911 operator to send an ambulance. Then she flew back to the altar area. Stunned, Natalia sank to her knees beside the priest. Tears stung her eyes, tears of self-reproach. How foolish she had been, to entertain such feelings toward him, who all along had loved Abigail! And look where loving him had gotten poor Abbie: bereft of her beloved St. Vladimir’s, moving out of town without even leaving an address, no job for her husband, and only a prayer book, a CD, and tears to show for it. And what better outcome could ever have been expected? None, none. Natalia might not have been to the university, and she might not be the world’s greatest genius, but a fool she would not be, at least not any longer. There is no swifter or surer quencher of passion than the realization that the other person's is directed elsewhere, and Natalia felt it all drain away. This man on the floor before her was no longer a secret love, nor yet a spiritual father to her, but a human being, and one in need. She had no time to think of herself or her own feelings. She had seen death as a child in Siberia and in the German camps. She knew its look. She sank to the floor, on her knees. “A thousand times a thousand, then!” She was choking. “Oh, I don’t know, Father! Her voice was reduced to a squeak. “I’m all confused, so confused! Her tear-drenched head sank to his chest. He reached up and patted her wet cheek. His hand fell from her cheek; his chest under her stopped heaving. She sat up. His unseeing eyes gazed at her. She closed them. The wailing of sirens outside drew nearer. She folded his hands over his chest. Then she staggered to her feet, still weeping, to go and open the door. My father is a mild, genial man, who by careful organization, planning, and orderly habits, manages to avoid most of life's annoyances. When misfortune does strike, though, he is apt to be cross. On this particular Saturday, Mother was in bed with the flu. My sister and I were running the household, and were feeling quite smug because nothing disastrous had happened in three days. I had done the week's grocery shopping all my myself, and Sharon had served up a fine series of dinners. Even our brother, Matt, had caught the spirit, and mowed the lawn and trapped sixteen of the field mice that were a plague that year. (They were imprisoned in a window well until he figured out a humane way to dispose of them.) If anything, the household was functioning more smoothly than usual. Until I ran the washing machine and forgot to unplug the tub into which it emptied. Our utility room was never meant for laundry anway. Adjoining the den in the basement, it had been built as a storage room (and was still bursting with cartons and cartons full of books, clothes, and old photo albums). There was no floor drain in that room. The water in the utility room must have been two inches deep. My father groaned as we all stood around looking at it. "Gad! Laura, you couldn't have made a worse mess if you'd tried." "I know," I mumbled. "I'm sorry." "Sorry doesn't help. This is absolutely the worst kind of thing in the world to clean up." I stood silently, blinking away tears. "Do you know what it takes to clean this up?" I nodded, for this had happened several times before, but Dad went on talking. "First, you have to move every single thing in the room. Every last boxfull. Then you have to soak up the water with towels; that's the only way. Towel by towel until your hands are sore from wringing them. Gad, was a tedious process!" "Well," said Matt, "let's get started moving these cartons." "Can't do that. They've got books in 'em. Have to take everything out, item by item. Look at those soggy bottoms. Ruined. Every last thing in this room, ruined." "I'm sorry," I repeated in a tearful squeak. "Room hasn't even had a chance to dry out since the last time your mother did this." He sighed heavily. "Well, let's get at it." He walked across the den to the couch, the carpet squishing with every step, and sat down to roll up his pants cuffs. "May as well take off my shoes and socks. Wouldn't want them ruined, too. Brand new socks." Then he stood up, waded into the utility room, and began hauling things out, amid much more panting and puffing than was necessary. "Whew, it's hot in here," he muttered presently, wiping his forehead on his sleeve. With that, he slogged through the water towards the window. Matt yelped at him, but it was too late. The window was open, and the mice, all sixteen of them, were scurrying down the cinderblock wall like Niagara Falls. Dad groaned. "That's all we need. A hundred mice. All over the house. Chewing up everything in sight. Reproducing like mad. Dying in between the walls where you can't get them, until the whole place smells to high heaven. It'll take months to catch them all. Months." There was nothing we could do just then, however, so we went back to work for more than an hour, unloading cartons, moving the furniture in the den, rolling up the soaking rug. "Well, I guess we can start getting the water up now," Dad sighed. "If we can find any old towels. They're probably all worn out from combat duty." They weren't worn out, but they were in use - by Sharon's skunk. Sharon had bathed her that morning (in the laundry tub, which is how it came to be plugged in the first place), and the skunk had slunk off behind the stairs where the torn and worn towels were kept, and had settled down on them to dry off. Rose was in a foul, snappish mood, and when Dad tried to move her, she nipped him. We used the good towels, after all. By supper time, when it was all over, it seemed pretty funny to everyone except Dad. Every time our eyes met, we kids had to hold our breath. It was impossible to keep sober faces, though, and one by one, we were banished to our rooms. Every time one of us left, stumbling over himself and free at last to howl, the more hilarious it got. Before long, Dad was left alone at the table, glowering. We were confined to our rooms for the rest of the evening, with only enough time out to do the supper dishes. Another time, we might have grumbled over this tyranny; tonight we were too busy hee-hawing. And anyway, our revenge wasn't long in coming. Dad sat down to calm himself with soothing music, and as the record dropped onto the turntable and the arm moved over, there was a tinkling sound. The stylus, along with the whole cartridge and a dozen microscopic parts, had fallen out of the arm, and been spun by the turntable in all directions. And there was a deep shag carpet on that floor. To come between you and Him. We are all of us babes. But a dream in its infancy? If death is to stunt its growth. Is our Father's pride and joy. in a better way than this. Of the Father of us all. To thank God for things that didn't occur. 'Cause I didn't do them - thanks a lot. But I'm glad I didn't mistake one for my pet skunk, Lily. Thanks to Your ineffable Grace. That didn't happen, thank You, Master. I'm supposed to be glad! Today we booked our flights. We are going to England on September 28 and coming back here October 12. During that time, God willing, we will complete the purchase of the flat in Ormskirk, Lancashire. That event is set for September 30. And then we will spend the rest of the time getting it set up and equipped, with things like dishes and towels. And we will spend some time, too, searching for old friends of Demetrios' who may still live there, or nearby. These four were meant to be read together. Be free to give and take and do! For you are me, and I am you. Never brought himself to look around. So he withdrew, just in case. And before he ever dared, he died. They're settled in their groove. There's no such thing as grace. You end where you egan. If you don't, you never can. You'll not become a better man. Evolution? 'Tis the devil's lie. You stay the same until you die. 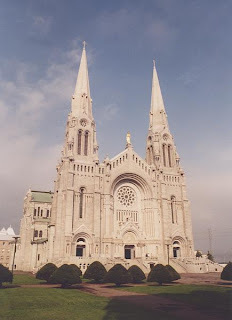 My mother's friend Annie went to Quebec and toured the Shrine of Ste. Anne de Beaupré. In the narthex, she saw a small boy in front of the candle stand, looking wistful. Annie could tell he was longing to buy a candle; apparently, though, he didn't have the money. So she approached him, held out a dollar, and said, "Would you please buy a candle with this and say a prayer for me?" The "prayer for me" part was simply to disguise the charity; Annie isn't very religious, and I have heard her express a particular dislike of Catholicism. The boy nodded gravely as he accepted the dollar, and asked, "What is your name?" One prays for a person by name, of course, whenever possible. Annie says the boy's face turned to wonder, to awe, to astonishment and joy. It made her uncomfortable, so she quickly left. Only then did it it dawn on her what had happend. She hurried back again to find the boy, but he had gone. Well, all this happened many years ago. The boy must be a man now, and perhaps he still tells his children about the time he was sad and penniless and couldn't buy a candle, and St. Anne de Beaupré appeared to him and answered his prayer. Whether to accept the Reformation's "solas" depends upon what each "sola" is intended to exclude. Sola Scriptura? Yes, if it meant any doctrine that contradicts Scripture should be discarded. But no, because it actually means all Christian doctrine is derived from the Bible (which is exactly backwards) and/or that the bare text is enough to interpret the Scriptures, and/or that the Bible can be read in a vacuum, "unnormed." That is simply impossible. Sola Fide? It again depends upon what is meant to be excluded. St. Paul, as the great Apostle to the Gentiles, repeatedly hammered home that one doesn't need the Law of Moses for salvation; instead, it's all about faith and always was, before, during, and after the period of the Old Covenant. So yes, if Sola Fide is used in the Pauline sense: we do not have to be Jews first and then Christians. We do not have to be bar-mitzvah or bas-mitzvah (son or daughter of the commandments). And again yes, if Sola Fide means you cannot buy or earn or bribe your way into heaven. But a big "no" to Sola Fide if it means to exclude the works of faith. Those are the works that reinforce faith in us, strengthen and build it, and help us mature in Christ, that test and exercise us in the faith. It is the works we do in faith, then, that determine, so to speak, the depth or the scope of our salvation. Put another way, the relationship we have with Christ when we die is the relationship with which we enter heaven, and it can be very weak or very strong or somewhere in between. That's what it means to say we are rewarded according to our works. Solus Christus? Yes, if it means, "Christ and not Brahman," or "Christ and not Moloch," or the like. Christ has nothing to learn from any prophet or imaginary deity or demon. Whatever truth Buddha had, Christ had and expressed better. But if Sola Christus means I sit there passive as a bump on a log, no. The Christian life cannot be lived passively. Sola gratia? Ditto the above. Yes, it is only by the grace of God we can be saved. But no, if it means to deny that we accept Grace by an act of free choice, another gift of Grace. Soli deo gratia? Well, sure... but then again, Christ said, in prayer, "The glory which Thou hast given Me, I have given them." So I don't know how one reconciles these. So once more, it all depends on exactly what's meant. 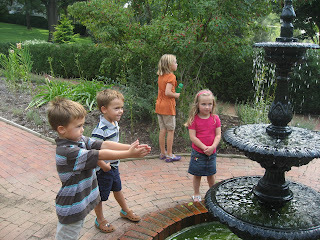 -c has a post on her blog, Transposzing, that I simply must share with you. It's about September 11th and it's a wake up call. Also, I have to tell you that I firmly believe every horrible word of it is the truth. And Truth, blessed Truth, however awful and hard to accept, is what sets us free. Here is an excerpt; please go read the whole. Today is the anniversary of a series of horrible events. It marks the eighth anniversary of the deaths (and injuries) of thousands in New York, Pennsylvania, and Washington, DC. The victims of the crashes should be remembered -- and as the Orthodox say, may their memories be eternal. And democracy in this country may have suffered a mortal wound: As Ben Franklin wisely noted, "The man who trades freedom for security does not deserve nor will he ever receive either." 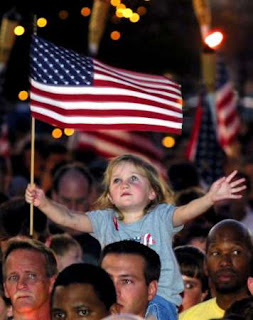 Nevertheless, in our USAmerican eagerness to forget the past, we stifled dissent -- calling it "treason" and "anti-American" -- even as we institutionalized racial profiling, denied basic human rights with policies of rendition and Guantanamoization, suspended basic First Amendment guarantees (for citizens, mind you) with the notorious and ironically titled "Patriot Act." “Fear of God is of two kinds. The first is generated in us by the threat of punishment. It is through such fear that we develop in due order self-control, patience, hope in God and dispassion; and it is from dispassion that love comes. The second kind of fear is linked with love and constantly produces reverence in the soul, so that it does not grow indifferent to God because of the intimate communion of its love. “The first kind of fear is expelled by perfect love when the soul has acquired this and is no longer afraid of punishment (cf I John 4:18). The second kind, as we have alrady said, is always found united with perfect love. The first kind of fear is referred to in the following tow verses: “Out of fear of the Lord men shun evil” (Prov. 16:6), and “Fear of the Lord is the beginning of wisdom (Ps. 111:10). The second kind is mentioned in the following verses: “Fear of the Lord is pure, and endures forever” (Ps. 19:9 LXX), and “Those who fear the Lord will not want for anything” (Ps. 34:10 LXX). ” St. Maximus the Confessor. I hope this whets your appetite to go and read the entire post. I greet you in the love of our Lord Jesus Christ on the Feast of the Universal Exaltation of the Precious and Life-Giving Cross, a major Feast of our Holy Orthodox Church which we commemorate each year on September 14. In Her wisdom, our Holy Orthodox Church designates a specific passage from the Holy Gospel to be read during the Divine Liturgy celebrated on this day. The reading, according to the Gospel of John (19:6-30), is a dramatic narrative of Christ's judgment before Pontius Pilate, and His crucifixion, suffering and death on the Cross. The Church also prescribes this day as a strict fast. The combining of this Gospel passage with the religious discipline of fasting is an intentional one by the Church, for it has the effect of inviting the worshipper to revisit central themes from the liturgical period of Great and Holy Lent. On this Feast, the Church reinforces these themes, focusing on the role of repentance and prayer in the Christian life and on the Cross as a constant reminder of the source of our strength, power, salvation, and life. It is in this context that we may appreciate our liturgical act today of raising the symbol of the Cross with our hands and with our hearts. In doing this, we remember that the Cross is much more than a symbol of our faith. Indeed, it is a sign that proclaims the ultimate victory of Jesus Christ over death the establishing of His redemptive work and perfect love which He demonstrated fully and completely on the Cross. This Feast of the Universal Exaltation of the Holy Cross, and the themes which it reinforces through the liturgical actions we express, the Gospel reading to which we listen, and the strict fast to which we adhere, direct our lives in the Way of the Cross. This is the way of sacrifice, as we take up our cross daily and deny selfish interests (Luke 9:23). It is the path of service to others in humility, not of earthly glory and treasure (Mark 10:21). It is the journey from death to eternal life, as we emulate the One who turned an instrument of shame into an emblem of victory. For us, as Orthodox Christians, the Way of the Cross should be our calling and our life-long commitment. For some among the people of God, this path of sacrifice and service has also become a sacred vocation in the Holy Priesthood. Our seminary in Brookline, Massachusetts, is most appropriately named Holy Cross Greek Orthodox School of Theology, and thus celebrates its Feast on this most blessed day. This Feast speaks with powerful relevance to the sacred mission of our Seminary in training the future Priests of our Archdiocese. It is the development of the priestly conscience, consistent with the arduous yet extraordinarily fulfilling path of the Way of the Cross, which is the task undertaken by all those who are preparing themselves for the Holy Priesthood during their years of study at our Holy Cross Seminary. In elaborating upon the significance of today's Feast, and in describing the virtues which are essential to priestly formation, it is only appropriate at this time that we work as a community of believers, the Church, to support our beloved Seminary. This support is expressed in one way through financial contributions that we are invited to make on this day. It is also expressed through our act of encouraging more and more young men in our parishes to consider the Holy Priesthood as a meaningful and blessed manner of life in our modern world. Our encouragement and support for those who are contemplating the Holy Priesthood must also be joined by our prayers for all those who are currently studying at Holy Cross, and for others who may respond to Christ's sacred call and dedicate their lives to the Way of the Cross as Priests of His Holy Church. In our own lives, we know the redemptive and saving power of the Cross. How many more lives will be led to an abundant life through our support of worthy candidates for the Holy Priesthood and our Seminary? How many souls will be lifted up unto salvation through the ministry of those who are called, trained and sent to share the Gospel of love and life? It is my fervent prayer on this beautiful Feast of our Holy Orthodox Church, that the strength, grace, and perfect peace of the Lord Jesus Christ, through the power of His Precious and Life-Giving Cross, may be with all of us, as we remember His love for us and dedicate our whole lives to follow the Way of the Cross unto eternal life. Now treat yourself to Fr. Stephen's post about this Feast/Fast Day. 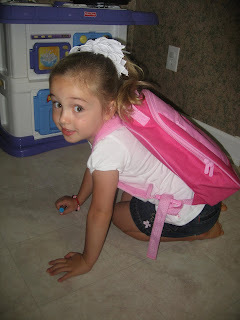 Here's Sydney, all ready for her first day of pre-school. 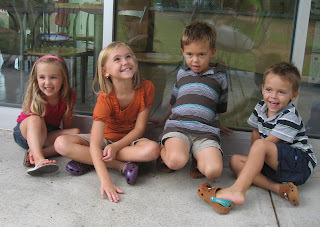 Sydney (4), Kelly (7), Ryan (4), and Connor (4). The boys are going to turn five on October 1st. 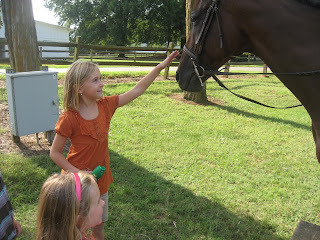 Kelly makes a horse's acquaintance as Sydney looks on. "Have they attacked Richmond?" I wondered. Ridiculous thought! Or was it? I lay there for a few moments wondering. Was it even plausible? Yes, it was. After all the unbelievable things that had happened yesterday, anything was possible today. There had been all kinds of speculation yesterday about Richmond as a target, because of the Federal Reserve Bank here. This was the first morning I could ever remember in my whole life when I had absolutely no idea what the day might hold. I could form no expectation at all of what today would be like. Somebody began banging on my front door. I glanced at the clock. Still not even 7:00. Now I knew something was the matter. Maybe we were being told to evacuate or something. Grabbing my robe, I flew down the stairs, tying it around me, and threw open the front door - to find three men who had come to install new carpeting! I had forgotten all about it and somehow, it seemed totally bizarre that such an ordinary, mundane thing as that should happen on the Day After, that life should go on. Later, I settled down in front of the television to await news of all those survivors, hundreds of survivors, they were surely going to find in that burning rubble. Once upon a time, there was a 5-pound toy poodle named McLeod ("Cloud") who lived with us and was very much beloved. As he was so small, he would get cold outdoors in the winters, even though I kept his coat very long (and well-brushed). I knitted him SEVEN different sweaters. Now, in cleaning out my attic, I've come across these sweaters. I have no use for them but cannot bear to throw them away. If you know a very small dog who needs some dashing winter sweaters lovingly hand-knitted, please let me know. All I need is a mailing address. Inspired by Andrea, who is cleaning up her blog, I'm cleaning out my attic. And the first thing I came across was a box of old love letters. Now I've been through these before, with a sharp pair of scissors, but his time, I'm sitting by the shredder. I've kept some of them way too long, and some of them are going to be shredded this very day. Like the one that begins, "Now you shall read the grateful outpourings of an ecstatic heart..." or "Thank you for your letter, coming like water to one thirsting in a desert. I have read and re-read your letter with many tears, and with more tears I write you this..."
Most of the letters I'm keeping, but some of 'em just have to go! Really, truly, I am not going to risk dying unexpectedly and having my children come upon this "goo", to use Andrea's word. It's amusing and so strange, how new love thinks itself so high and holy and sacred (and it IS!) yet how much of it, in retrospect, is simply driven by hormones, and how easily one can confuse the one for the other. No need to put that on display for posterity. Demetrios had gone to Charlottesville for a week of continuing education in forensic psychiatry. I had determined to take three days of that week off from housework while he was gone. I wouldn't cook, I wouldn't even get dressed. I'd just goof off. My plan was set back a day because Daphne's father (and Ero's husband), Matthew, hadn't quite finished painting our downstairs. He finished up around mid-day on Monday. Monday evening, I went to KFC and bought a whole bucket of extra-crispy chicken, with a pint each of three different sides. I hadn't eaten KFC in years and I had a craving for it. This would be my suppers and maybe lunches for the rest of the week. Next day, a gorgeous day, I began my planned hibernation by sleeping in until 8:30 in the morning. I got up and prepared myself tea and orange juice and toast, same as every morning. Then I thought I'd just watch television while eating breakfast. We never watched TV in the morning, but today I would. I tuned to CNN just as the first plane hit one of the Twin Towers of the World Trade Center. It took about an hour for my hibernation to end. Nobody, that day, wanted to be alone. I curled and brushed my hair and got dressed and went next door. Michaux opened her front door and I said, "What are you doing?" "Just playing on the computer," she said. "Well, you need to turn off the computer and turn on your television!" Our jaws dropped open when the red headline came up on the screen: "America Under Attack!" We turned and stared at each other, open-mouthed. Once, Michaux looked over at me, quite suddenly, and said, "What's today's date?" "We'll never forget it, will we?" We kept watching until her children came home, one by one, each on a different school bus. I don't remember what the oldest said, except that he didn't know what had happened. The middle boy said, "Mom, soccer practice is cancelled tonight." "Do you know why?" asked Michaux. "Are they going to attack Richmond?" "No, dear, I don't think so." "Where's New York from here? Is it far, far away?" Demetrios phoned that evening, and addition to everything else, he was worried about his brain. "My love, today I have realized there is something wrong with it," he said. "What seems to be wrong with your brain, my sweet?" "Well, I don't know. But I have watched those videos of the Twin Towers over and over again, and no matter how many times I watch them, my mind still refuses to believe what it sees." Mom was approaching the commissary at Fort Myer, adjacent to the Pentagon, when she heard on the radio that the Pentagon had been hit. "They'll never let me in the gate today," she decided. She crossed the bridge over the Potomac and then turned around to come home. Dad was getting his excercise by walking the whole way around Lake Accotink, where he met a crazy woman who told him some deluded tale about the Word Trade Center having collapsed. He got away from her as quickly as courtesy permitted. One of Sylvia's daughters was in a business meeting in Charlotte, North Carolina, in the basement of some office building. The meeting began at 8:00 and went until noon, when the participants decided to eat lunch together at a favorite restaurant. That's when they paid attention to another oddity: the city streets were deserted. At noon. On a Tuesday. They began to have apprehensive feelings. They looked at one another and wondered, has the whole world changed, or something, while we were gone? 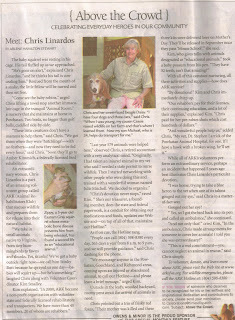 Local Hero: Our Very Own Chris! *Daisy, pictured with Chris, is obviously not a Beagle, but a Basset Hound. *Chris's son's name is Matthew, not Michael. If you click on the image, it will become full-screen and you'll be able to read the article and see the photos very easily. It was nearly midnight. I had finished feeding the kittens and the squirrels. I had washed up their dishes, leaving the squirrels, in their wire cage on the front porch, struggling to figure out how to get back into their nest basket. I dried my hands, put the kittens back in their box and closed its door, then went out to help whichever squirrels still hadn't managed to find their way back into the nest. My eye caught a movement in the shrubs, and when I turned to look, two dark eyes disappeared into the shadows. Now I was mad. "Come out of there!" I said, trying to shout, but not all that loudly, as it was midnight. So out waddled a very large, fat raccoon. S/he didn't want to go far, not while six warm, furry meals were beckoning. S/he ambled slowly over to the tree and waited there. Raccoons are more dangerous than cats or foxes, because of their manual dexterity. They can open nearly anything when they have a strong enough motive. Fortunately, this one hadn't yet gotten beyond the looking stage. The squirrels were frozen in place from terror. I picked up each one, examined it thoroughly for scratches (none found! ), bundled them all up, and took them inside for the night. NOW WHAT? That raccoon will be back. I suppose I'll have to move the cage into the back yard and be sure to keep it well covered with a sheet and a tarp. DECISION: I am NOT wintering these guys over! If they cannot be released before the trees lose their leaves, then somebody else will have to take them. UPDATE: Miracle! Their mommy returned from her vacation, and came, and picked up not only the two kittens, but also all 8 of the squirrels! It was my (mis)understanding that she could not take the squirrels back, but she did. My wild animal nursery is now blissfully empty, and I intend to keep it so for a while. Earlier this week, I read a couple of complaints about the Orthodox, to the effect that we reinterpret Old Testament. This, charge the critics, is very troubling. I daresay it is. But I do rejoice that they recognize an important fact: we do not interpret the Old Testament the way the ancient Israelites did, or for that matter, the way Jews today do. St. Paul says as much. To explain this further, I'm reprinting a slightly redacted version of a post that originally appeared here in January. Old Testament Interpretation (Like Everything Else in Christianity) Begins and Ends With Jesus Christ. In the Church’s view, the whole of Israelite history, as contained in the Old Testament, is about Jesus Christ. The relationship of the Old Testament to the New is one of promise to fulfillment, and of type to anti-type. Put another way, we interpret the Old Testament neither in the same way the ancient Israelites did, because we are looking at it with hindsight; nor in the way Jews do today, for everything in it takes on new, fuller, and sometimes rather different meaning in the light of Christ. The Fathers insist that the God with whom all the Old Testament figures deal is God the Son. It was God the Son who walked with Adam and Eve, God the Son who appeared to Moses in the burning bush, God the Son who instructed Noah to build his ark. In other words, God spoke to ancient Israel with great and gracious condescension, in His decrees making generous allowances for His people’s spiritual weakness and immaturity. He allowed divorce because of Israel's hard hearts, and someone has pointed out that God didn't even forbid polygamy! In the Old Testament (even sometimes in the New) things were written in over-simplified words and somewhat crude concepts and imagery to make it understandable to people. Meat is for adults; infants cannot digest it and need milk instead. The Old Testament is spiritual milk. The meat must await the coming of the Holy Spirit. St. Paul also found new, Christian meaning in the Old Testament. For example, in I Corinthians 10, he says the Israelites, by passing through the sea, “were baptized unto Moses.” (10:3) Then, speaking about the rock in the desert which Moses struck with his stick and it gushed forth water for the thirsty Israelites, St. Paul says, “That rock was Christ.” (10:4) In verse 6, he adds, “Now these things were our examples, to the intent we should not lust after evil things as they also lusted.” They happened, that is, more for our sakes even than for the sakes of the ancient Israelites. St. Paul is much more concerned with the function of these events as examples today than as history; in fact, the part he mentions in verse 3 about the rock following Israel isn't history at all, but pure legend. As a practical matter, whether it was history or not wasn't relevant; our edification today was what counted, and still counts. In Galatians 4:21-31, St. Paul calls the story of Abraham, Sarah, and Hagar an allegory (v. 24), which allegory he expounds. In fact, what the "noble Bereans" did, to whom St. Paul preached, was exactly this: they searched the Scriptures (the Old Testament) to see whether they could see in the Scriptures the newly-announced meanings St. Paul was preaching. The meanings were different from what these devout people had been used to. Even those who criticize the Orthodox for doing this do it themselves, although not in a sufficiently thoroughgoing way. For example, virtually all Christians see Psalm 22 as an astonishingly detailed prophecy of the Crucifixion. But before Jesus was crucified, there was no way to interpret that Psalm in that way. Similarly, in Isaiah 7:14, Christians see a prophecy concerning the birth of Christ: “Therefore the Lord himself shall give you a sign; Behold, a virgin shall conceive, and bear a son, and shall call his name Immanuel.” But before Christ came, the prophecy only meant that God would destroy King Ahaz’ enemies within the time it would take for a maiden to marry, conceive, give birth to a son, and teach him the difference between right and wrong. Christians have always "reinterpreted" the Old Testament. That is, they have understood things that were always there, but only revealed in the Light of Christ. Outside of Orthodoxy, however this procedure is the exception, unfortunately. More often, it's the wrong way around: the Old Testament is used as the framework within which to understand Christ. If we fail to allow the revelation in Christ quite frankly to re-work the pre-Christian understanding of the Old Testament, to let Christ be the Light of the World, by Whom and in Whom all else is properly understood, our reading of both Testaments will be very seriously misguided and the correct doctrine of salvation will be in jeopardy. Now please go and read Fr. Stephen's far better (and shorter!) post for some different points on the same subject. Which Way Would You Like Your Mind Boggled?